I was travelling through Oxfordshire, "church crawling" as I believe it's called, when I drove straight past the wonderful sight of one set of stained glass windows visible through the other. Unusually this church, St James' Aston, was open, empty and very light inside, with a coordinated set of patterned windows and a few commemorative figurative ones that I ignored. 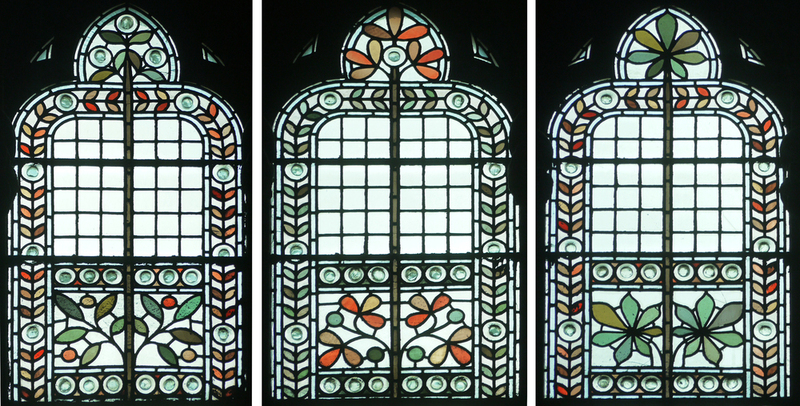 The even light of a dull summer's day was perfect for viewing and photographing the stained glass. There are 18 of these lancet windows with up to three medallions of coloured glass, crazy patchwork style, in each with a dedication below. I have always loved this way of making stained glass, it's as fun to look at as it is to make, with unexpected juxtapositions and colour combinations. These fragments don't look that old and could some of them have been made especially for the scrap box (cheating in my book)? The latest date on a dedication panel is 1970, that's all I've been able to find out about the windows so far. Inside the nave, plain apart from glass medallions, kneelers & pews - all very attractive. These top two ovals are my favourites; like many of the ones shown here the medallion is centred around a face, expressive, poignant or sliced down the middle. I really admire the compositional skill of the artist who put these together, I stayed for ages gazing up at them. Scroll down for more photos, all of them are from the eight nave windows, and as usual, click on an image to enlarge. The Great Hall, Manchester Town Hall - between weddings - with 4 of 12 murals painted by Ford Madox Brown between 1879 & 1893. Click on all images to enlarge. Since I discovered that I have in my bedroom a chair "possibly designed by FMB", see previous blog entry, I have been very keen on Ford Madox Brown. On my recent trip to Manchester I managed - between weddings - to get in to the Great Hall of Manchester Town Hall to see the murals that he painted there towards the end of his life. However, as I approached the hall via one of the magnificent staircases, I was so absorbed by others aspects of the building's interior decoration that I couldn't concentrate on the paintings. Great Hall Foyer, photo by Michael D. Beckwith. Block of 6 stained glass panels. The first thing was the roof, simply glazed to my great delight with "brown and yellow windows", see another previous blog entry, of my favourite type, with no lead just brown paint and silver stain. The inscription on the glass reads "THE MAYORS MANCHESTER FROM THE YEAR OF INCORPORATION TO THE OPENING OF THE BUILDING " with names and dates from 1838 to 2003, well after the opening of the building. The lettering changes over the years but the cotton plant does not. Then there are the windows. They admit a beautiful quality of light to the interior of the building, including the Great Hall itself, where there is a complete set of delicately coloured stained glass windows. Here I found a favourite motif, see yet another previous blog entry, the wonderfully decorative horse chestnut leaf. 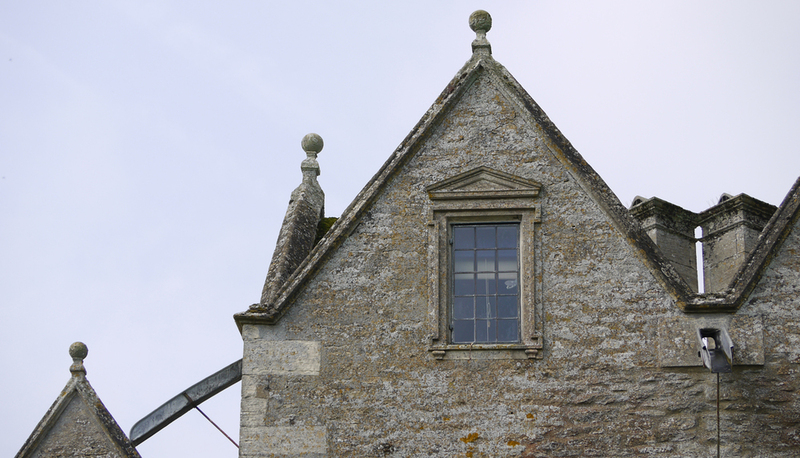 Details from the 3 window types in The Great Hall (in my order of preference). Wandering around the corridors and into the public rooms on the first floor I came across mosaic floors, painted walls, textiles, carvings and patterned ceilings. The work was carried out by at least three different firms but all, including the lettering, said to have been designed by the architect of The Town Hall, Alfred Waterhouse. In the south vestibule, horse chestnut motif around the door frame and original patterned ceiling. I had a commission to make two fanlight windows for a friend's house in Poland. She said offcuts would do, so I put two leftovers sideways in my studio window and waited for inspiration. I had made the glass in 2000 for an exhibition, the pink one broke and I remade it in yellow but was never satisfied with the results. You can see in the pages below from my 2000 sketchbooks that there was a lot going on here - how could I add something while also making sense of a poor composition ? Meanwhile another friend, the artist Wendy Smith who I met when we were students together, came to stay. She had a lot to say about the process of transformation, you can read about it on her blog. Her ideas spoke to me about the danger of overworking versus making a fresh start. I have often tried to make new pieces on top of old samples and all I got was a struggle made visible. The new panels in my studio, finished last week. This time, I sandblasted across the glass backgrounds with star/flower shapes, as if embroidering figures across a patterned and pleated fabric ground. The yellow ground got pink details, the pink ground got yellow and a fantastic rich amber made from a mix of enamels. You can see the depth of the old lines under the surface of the glass in the details below. WM commented on the church of St. Michael and All Angels at Eaton Hastings as being a companion in size and layout to those at Buscot and Kelmscott. Looking across the river from Kelmscott Manor, you can see the clump of trees surrounding the church, but it's a winding walk away because of the bridges over the Thames. Inside are interesting windows, and a tasteful interior as the cushions and kneelers are in the same jade green as the glass borders. I like the white/green and green/white reversal in the first two windows above, and I love the little piece of C18th painted glass above right. Below are the windows from Morris & Co in the church. Left to right; Christ from a design by EBJ (1877), St. Matthew from a design by EBJ (1872-4), St. Michael by FMB surrounded by angels and Saints Raphael and Gabriel designed by WM but not made until 1935.